A student-led health psychology conference! Registration open to the Big Apple Health Psychology Colloquium! We are excited to invite you to the First Big Apple Health Psychology Colloquium, which will be held February 20th, 2019, at The Graduate Center, City University of New York, at 6:30 PM. REGISTRATION: The 2019 registration form is available at https://www.surveymonkey.com/r/PNVCSXF. Registration is free but seating is limited! 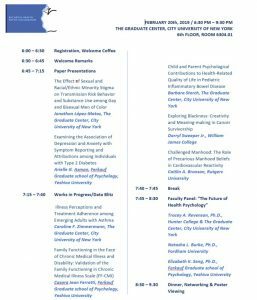 ABOUT THE COLLOQUIUM: The Big Apple Health Psych Colloquium is a bi-annual student-led event that brings together doctoral students from Psychology programs in the NYC area with an interest in health psychology. The two main goals of the Big Apple Health Psych Colloquium are 1) to disseminate students’ research; and 2) to foster an environment that encourages collaboration with students and faculty across CUNY and other universities in the New York City area.